No Comments on Why Buy A 24” Wide Half Round Waste Receptacle? 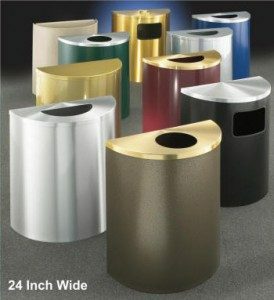 Using large capacity waste receptacles assures that your facility you can handle a large volume of trash at any time. 24” wide half round receptacles from Glaro Inc. fit neatly against walls. They are available in both 29 gallon (top opening models) and 24 gallon (side opening models) capacities. When combined with the Glaro 18” wide half round receptacles, facility managers can outfit most areas indoors or out. Even in hallways, against walls, and in other areas where space is limited and traffic can be busy, the need for trash collection remains the same. Streamlined half round receptacles save significant space. Furthermore, they can be mounted onto walls, facilitating floor maintenance. Some manufacturers only provide models with completely removable, unhinged covers. Instead, choose a manufacturer that offers a hinged lid. For example, Glaro Inc. half round receptacles come standard with a full length concealed piano hinged lid that allows janitorial staff to easily access trash without removing the cover. 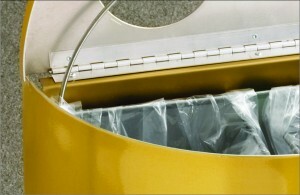 The lid lifts up and down, making trash removal an easier task. In addition, the larger than usual capacity prevents the need for continuous emptying of the trash potentially saving expensive janitorial service costs. Glaro’s 24” half round receptacles have covers and bodies constructed of aluminum or steel, depending on the finish chosen. The inner liner cans are made of steel with rust-proof aluminum bottoms. Some manufacturers may produce a plastic inner liner instead. Unfortunately, a plastic liner does not provide the same level of fire safety, or durability. The weight of the all metal receptacles also makes the units more stable and ideal for heavy use. Finally, these receptacles have the added benefit of coordinating with all other Glaro Inc. product lines to create a professional, uniform look throughout any facility. The line is now available for purchase.